There are two versions on the map available, a smaller file for faster download (311 KB PDF) and a more detailed image with contour lines (2 MB PDF). This is the most popular route to the park because Kitgum is the nearest place that has clean fuel, cozy beds, hot food and cold beer at Fugly’s.The last third of the drive, north of Orom, becomes very scenic. Although both the Kitgum and Kaabong approaches have been totally safe for tourists since about 2009, the westerly route is still preferred by some who worry about vestigial insecurity related to cattle rustling in southern Karamoja. I recently posted turn-by-turn driving directions from Kitgum to Kidepo. This route passes through Opotipot Junction, Karenga , Locomo Junction, Loluko, Akilok Junction, Orom, Kalabong Junction, Naam Okora, Tito Okello’s home, Omiya Anyima, and Kitgum Matidi. 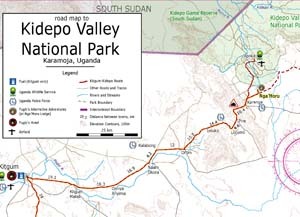 The connections to Kampala via Lira or Gulu and the easterly route from Kidepo to Kampala via Kotido, Moroto and Mbale in Karamoja are also shown. Note that all existing public maps have shown an incorrect route via a non-existent road passing around the south of Mount Rom. Google Maps still erroneously places the town of Karenga south of Pire, by Lokapuke. 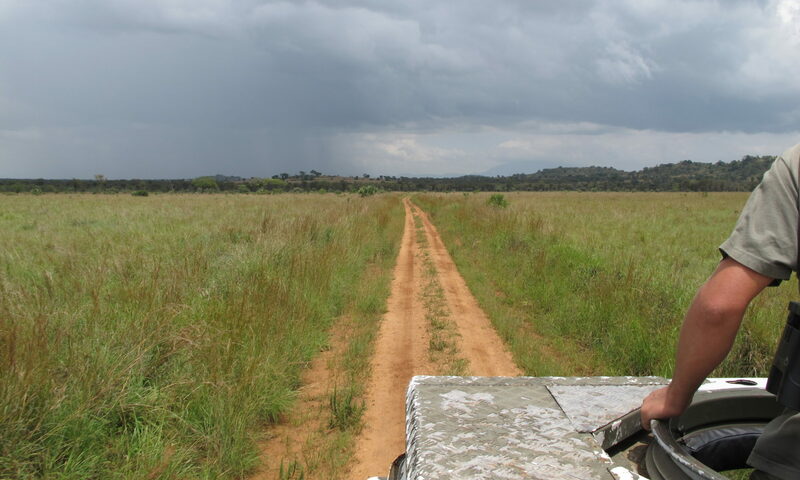 Essential services for self-drive safaris shown include the Uganda Police Force, Uganda Wildlife Authority (UWA), fuel, Fugly’s Hotel, Fugly’s Alternative Adventures (at Nga’Moru Lodge) and the airfields at Kitgum (ICAO HUKT) and Kidepo (ICAO HUKD) (also known as Lomej airfield). It should go without saying that a sturdy four-wheel-drive vehicle is absolutely required for this drive, and even with 4×4 the wet-season mud and dry-season washboards can be treacherous for unskilled drivers. I lost count of the number of HiAce-type safari vans that we recovered from the mud. Many thanks to everyone who helped me map these roads, especially Pat at Nga’Moru, the legendary hunter Nigel Theisen and Tyson at EverySafari (the new home of Wajoli). As always, I welcome questions and comments at my contact page.